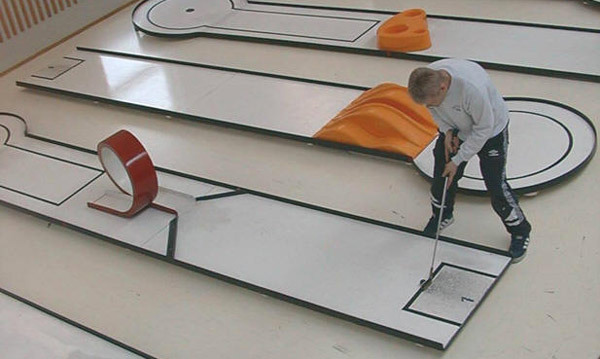 One thing about the playing techniques of minigolfers must be mentioned right away: there are no two players with a similar technique. The game does not require much use of force, and therefore it is not necessary to apply the theoretically most efficient techniques (what comes to force anyway). 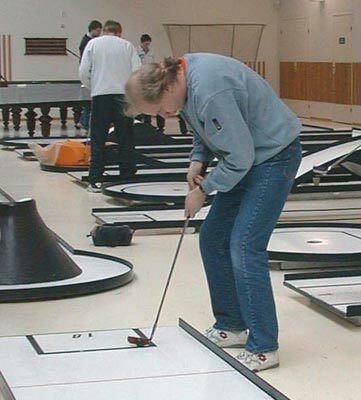 Each player can choose the playing technique that best fits his own bodily structure and personality. There are three different basic grips to choose from: backhand, forehand, and overlap grip. Pictures 1 and 2 above show backhand grips, if the shots are played into the direction of the arrows. (If the shots were played into the opposite direction, then these would be forehand grips.) 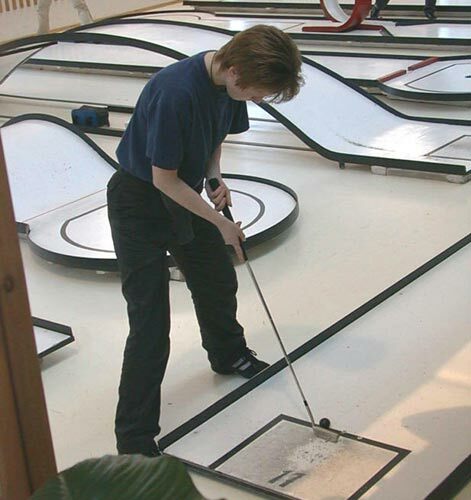 Picture 3 shows an overlap grip, which is very rare on top-class level of minigolf. 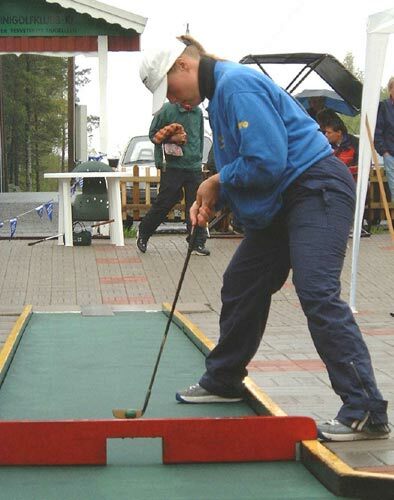 The backhand grip in picture 1 is clearly the most common grip used by minigolfers. It gives firm control of the club, and requires little movement of the upper body when playing a shot, as the muscles of your arms take a great share of the physical effort of the stroke. The grip in picture 2, with the hands farther apart from each other, distributes the physical force required by a stroke more to the upper body and less to the arms. This is no problem on eternite or beton, where the shots involve very little use of force, but on long felt courses such a grip might be a slight disadvantage. The forehand versions of grips 1 and 2 (the direction of shot against the arrow) involve slightly different muscles of the body when playing a stroke. The difference between backhand grips and forehand grips is so essential that many players find it absolutely unthinkable that they could ever learn to play with a forehand grip, if they now use a backhand grip, or vice versa. Backhand grips are more common than forehand grips, but both of them are seen on international top level. The overlap grip, shown in picture 3, is the least recommendable of these alternatives. In overlap grip the outer hand holds the inner hand instead of the shaft of the club, which is great waste of gripping power. To equal out this disadvantage, the player must press his hands forcefully together, if he wishes to keep the putter in firm balance. In all grip types it is possible to keep one or two forefingers straight, as seen in picture 2. Many players feel that this helps them to better control the balance of the putter. Generally it is advisable to first try the backhand version of grip 1, and then test the other options if this does not feel good for you. The backhand grip in picture 1 probably gives you the best overall control of different shots, from the most gentle to the most powerful ones. 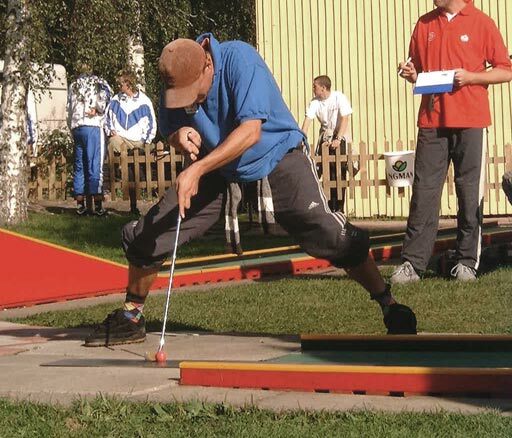 Some of the playing stances seen in minigolf competitions may look a bit weird at first sight, if you compare them to the classic putting stance of golf. 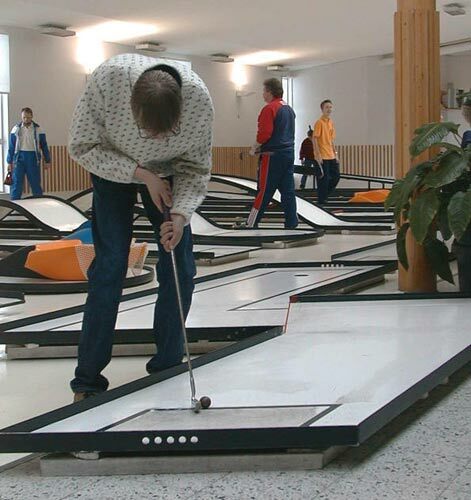 A “one and only” orthodox playing style does not exist in minigolf (or in golf either): the tallness, age, weight and personality of players affect the choices of playing stance. In the classic putting stance of golf, one’s feet are some 30 cm apart from each other, pointing straight ahead. 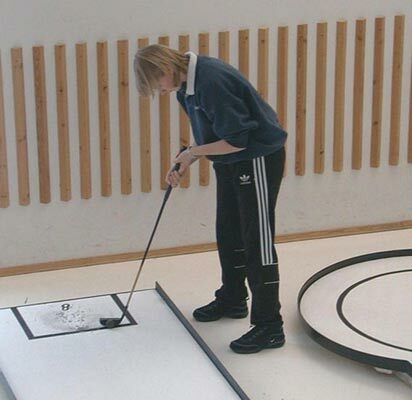 This position of feet is very common among minigolfers too, especially on felt courses. You should never keep your legs closer to each other than this, because you need to stay well balanced while playing a stroke. Many players prefer a wider stance, with the feet up to 90 cm apart from each other. 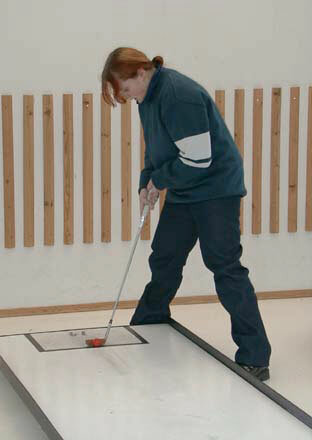 This reduces rotation of the body during swing, which may be seen as an advantage in search of a technique with maximum stability. On the other hand, the player needs more muscle force to play the strokes, since he loses some of the pendulum effect produced by body rotation. The best felt players of the world generally use a narrow stance (feet not much wider than the shoulders) with great pendulum effect, which enables them to play powerful shots with little muscle effort. Traditional beton and eternite players with wide playing stances often find it difficult to play powerful felt shots accurately, especially under the psychological pressure of competitions. The basic doctrines of golf swing come handy in powerful felt shots: wide swing, feet close to each other, upper body in rotation. Here lies the secret of great force with little effort. Players with narrow classic stances may have some difficulties in playing the most gentle shots accurately, however. In the classical narrow stance one’s whole body rotates during the swing, and one’s sense of balance will automatically and unconsciously interfere in the action. 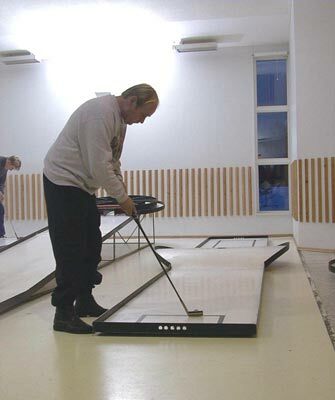 The player is not necessarily in full control of all the movements of his body, as the sense of balance functions independetly of one’s consciousness. There is a danger that the sense of balance will interfere in the bodily movements in a slightly different phase of the stroke at different times, which might cause some irregularity to the strokes. Especially so during the psychological pressure of competitions. 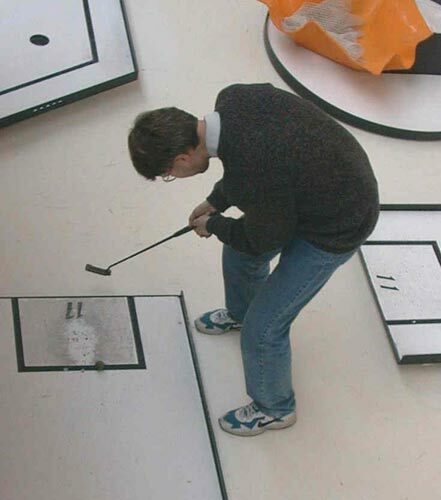 Minigolfers do not always position their feet symmetrically behind the ball. Many top-class players use asymmetric “forward” stances, in which one’s whole body is turned slightly into the direction of the shot. Such stances come handy on eternite, where an asymmetric forward stance is often the only possible way to get close enough to the ball, to play the shot with great stability. 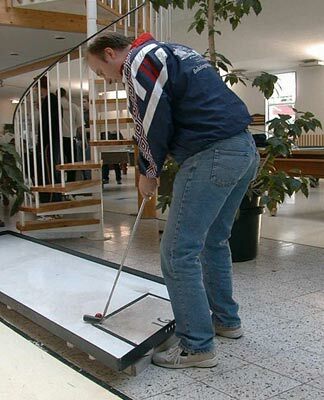 An asymmetric stance may cause some unwanted spin to the shots of the player, which is a great disadvantage on felt. If the club-head does not rest horizontally on the lane when you are sighting, the risk of a poor hit to the ball increases greatly. Your putter may either hit the ball too high, or then swing too low and hit the lane. Both options give a very bad result. The putter angles of minigolfers vary between 90 and 130 grades. The wider the angle is, the wider will be the swing of the stroke, which gives more force to the stroke with the same muscle work. 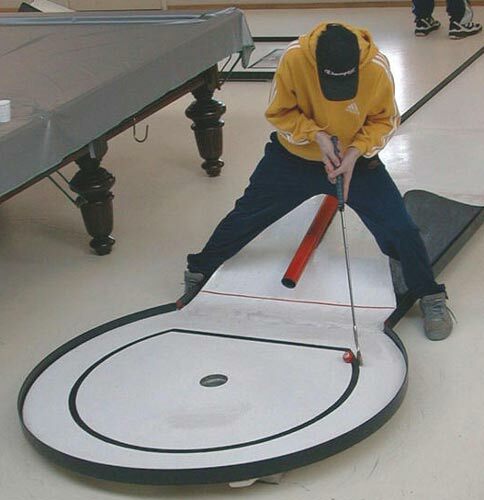 On eternite a wide putter angle makes it easier to reach the ball on the lane, as players are not allowed to step on eternite lanes. The disadvantages of wide putter angles are greater need of space for one’s playing stance (which may cause some trouble on beton and felt courses) and the need to bend one’s upper body lower down, which places heavier stress on one’s back muscles during a long competition day. The standard putter angle of around 115 grades is a recommendable starting point for anyone. The exact putter angle that is best for you depends on your grip and the preferred overall body position. Whatever your putter angle is, and in whichever position you decide to keep your feet, make sure that your heels stay firmly on the ground during the stroke. If you feel tempted to lift one of your heels in the air after the putter has hit the ball, your stance probably is not stable enough to make success possible on top-class level. Try a different position of the feet, possibly with the feet pointing slightly away from each other. Make sure that your legs are slightly bent, so that the weight of your body rests on the muscles and not on “locked” joints. Your muscles must have active control of your movements and balance. 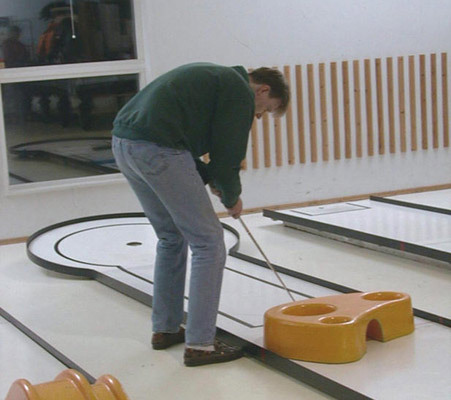 But don’t bend your legs too low either, so that your leg muscles grow tired after an hour or two out on the minigolf course. 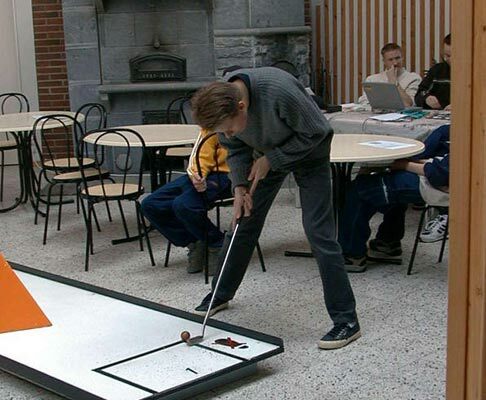 Older people generally use more upright stances than young players, to avoid back pain and fatigue after a long day of playing minigolf.